The Northwest Sector of McKinney comprises almost 30,000 acres of land north of U.S. 380 and west of U.S. 75. 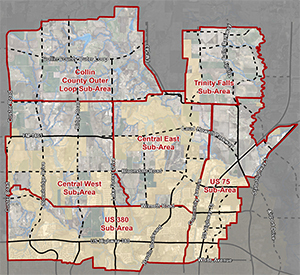 As of 2014, only about 42% of the Northwest Sector already sits within the McKinney city limits; the remaining 58% falls outside the city limits but within the city’s Extra Territorial Jurisdiction (ETJ). As a way to proactively prepare for the anticipated growth in this area, the city launched the Northwest Sector Study in 2013 to consider important issues such as infrastructure, natural resources, transportation, land use priorities and the overall quality of life for the current and future residents of this area. In February 2015, the Northwest Sector Study Phase I Report was unanimously approved by the McKinney City Council and now serves as an important policy guide for decision makers. The Phase I Report is the conclusion to Phase I of the Northwest Sector Study Planning Initiative. The report creates a vision for the Northwest Sector to guide and influence the pattern of growth and desired development quality over the near-, mid- and long-term. On June 18, 2015, the North Central Texas Council of Governments presented the City of McKinney with the prestigious CLIDE (Celebrating Leadership In Development Excellence) Award for the Northwest Sector Phase I Report! This award recognizes innovative projects that help to accommodate the rapid growth that is expected throughout the North Texas region. Learn more about the CLIDE Award. a retail market analysis; local streets policy; annexation and growth strategy; public-private partnerships; and infrastructure prioritization.